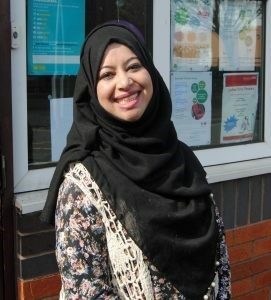 Shining light Liza Ahmed Chowdhury has found a new passion for learning, gained employment and qualifications – and has now been elected to our Board. The 35 year-old mother of two who currently holds down three jobs (including running her own business) and has just bought a new house in Newton, has impressed members of her community with her compassion, drive and energy. When she arrived in England, she quickly adapted to a new life-style living with her in-laws and taking on the full time caring responsibilities for an elderly grandmother and a mother-in-law who was paralysed down one side of her body. Despite encouragement from her husband, she delayed studying for years and instead formed a strong bond with her extended family. So while Liza spent ten years growing her own family and looking after older relatives, she failed to find time to do things for herself. She had immersed herself in family life and put her own development needs aside. But Liza looks back at those times with great fondness. Her attachment to her extended family is something she is very proud of. Caring for older relatives inspired her desire to work as a carer and bringing up her two children in such a loving setting has given them some great role models for life. Liza seized the opportunity to shine. With her new-found confidence, she achieved 24 accredited qualifications, completed a hair and beauty course at Ashton Sixth Form College, formed her own home-based business and became a lunchtime organiser at a local primary school and a carer for older people in Stalybridge. She even worked as a volunteer ambassador for the Fire Service, visiting homes and educating people on fire safety. At first, when Liza started to make time for herself, her family supported her and encouraged her. But not everyone around her were supportive. Many felt that it was an impossible task, to reinvent yourself as a successful business owner, after so many years spent looking after family.